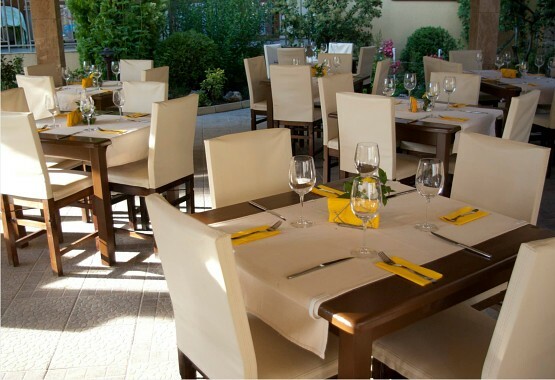 Restaurant Siana is situated 250 m away from Sveti Vlas Hotel, on 2, “Yug” St., in the complex of the same name “Siana”. All guests of the hotel receive a permanent discount of 10% for the whole menu. Restaurant Siana offers a rich menu, cosy surrounding and perfect services, it has a wonderful summer garden, where you can have your meals and quench your thirst in the hot summer days. The restaurant has a free parking-lot. Daily from 08:00 to 00:00 o`clock. In Restaurant Siana in the town of Sveti Vlas you can order breakfast, thin pancakes, delicacies, Greek and Mediterranean cuisine, pizzas, sandwiches, seafood, soul food and vegetarian cuisine.